A lot of families traveling to Disney World do so by car, but not all do. With lowered costs for plane travel and the advent of Disney’s Magical Express, not every family opts to drive, or to rent a car after arriving. So what is the travel landscape like at Disney World without a car? 1) Disney Bus Transportation. The bus system will be your primary mode of transport. The Disney World bus system is essentially a hub-and-spoke — with each theme park, water park and Downtown Disney acting as a hub, and each resort as a spoke. From the hubs, buses to each Disney resort are available. Let’s say you’re traveling from your resort to another resort for dinner. Be sure to add extra time for your travel since it will take you two trips — one to a park or Downtown Disney, and another to the other resort. 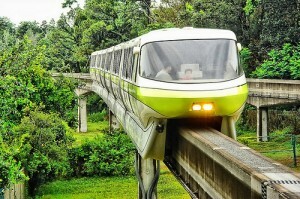 2) The Monorail. If you’re staying at a Monorail resort (the Contemporary Resort, the Grand Floridian Resort, and the Polynesian Resort) you’ll be able to get to both the Magic Kingdom and Epcot using only the Monorail system. It’s also just plain fun to ride around in! 3) Disney boats and ferries. There’s a lot of lakes at Disney World. So, boats and ferries are available in several places, like the Magic Kingdom and Epcot resort areas. For instance, you can take a boat from Wilderness Lodge to the Magic Kingdom, or you can take a boat from the International Gateway at Epcot to Hollywood Studios, with stops at resorts along the way. 4) A cab. If all else fails, there’s always cabs available. Cabs can work well in a pinch if you’re trying to get somewhere quickly, or get stuck somewhere late at night. Read more about Disney World transportation in our Transportation To and In Disney World guide. This entry was posted on Saturday, January 15th, 2011 at 11:42 pm	and is filed under Transportation. You can follow any responses to this entry through the RSS 2.0 feed. You can leave a response, or trackback from your own site.